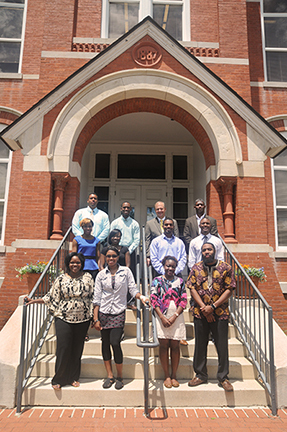 Auburn University’s College of Education recently welcomed seven prospective graduate students to campus as part of an innovative recruitment program developed by Dr. Jared Russell, Associate Professor in the School of Kinesiology and Director of Student Development for the College. The students are all seniors or recent graduates, and are primarily from Historically Black Colleges and Universities (HBCUs), including Morehouse and Spelman College, both in Atlanta, and Alabama State University in Montgomery. One of the students is from Nova Southeastern University in Fort Lauderdale. 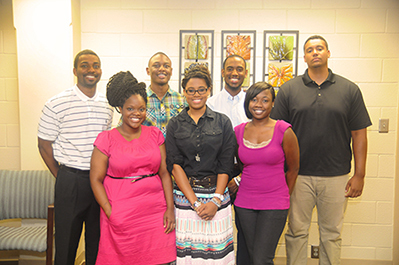 At a welcoming luncheon on June 17, Russell told the students that the program was rewarding, but demanding. College of Education Dean Betty Lou Whitford was also on hand to welcome the students. Dr. Russell told the students how he was introduced to Kinesiology graduate school. Kinesiology doctoral students Michelle Vaughn, Desmond Delk, and Bridget Peters serve as hosts to the visiting students and help Dr. Jared Russell facilitate the program. Also pictured is Dr. George Flowers, Dean of the Graduate School, who welcomed the visitors to his office in historic Hargis Hall.